So, how do you build a timber frame carport? 10mm structured polycarbonate sheet is the cheapest material for an open sided carport or pergola. If you are are building a large structure you could also consider 16mm or thicker. For a conservatory, choose the thickest you can afford giving extra insulation. Use the widest sheet you can comfortably handle, this will reduce the number of glazing bars required keeping costs down. It is very easy to underestimate the size and difficulty of handling sheets particularly in windy conditions. We recommend rafters at 600mm or 700mm centres depending on the width of sheet used (maximum width 1830mm or 2100mm). This will support the sheet on both edges and twice in between. F Section is used to start and finish the carport and glazing bars used to connect the sheets. Fixing buttons are used on the support rafters between the glazing bars. Decide which sheet you would like then check available widths. Ideally we would suggest your Timber to be at 610mm centres (10mm Clear or bronze haze ( Borg)) or 710mm centres (all other polycarbonate). Omegabuild can supply a timber supported lean to kit with the components you require. It is based on 1050mm sheets and can be supplied with 10 twinwall ,16 triplewall or 25mm polycarbonate sheets. To see the range of sizes we offer have a look on our website for lean to kits. If you would prefer to not use timber rafters we also have a range of self supported perspex lean to roof kits. To find out more have a look on our diy conservatory roof kits on our website and wall canopy products. 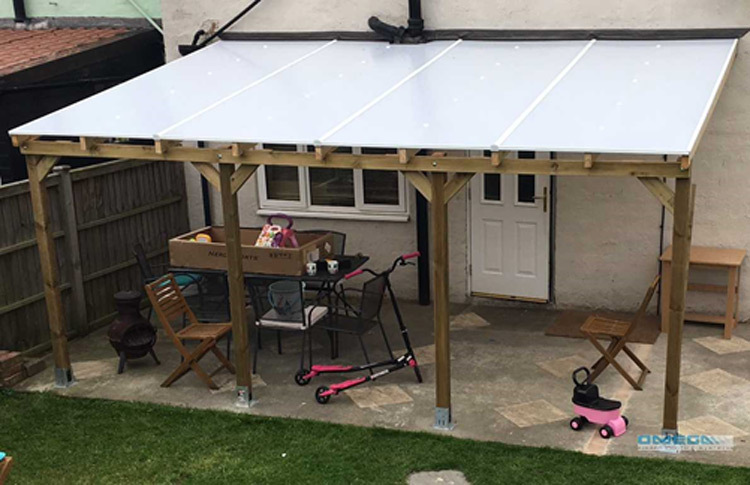 If you would like to have a complete aluminium kit with legs and guttering Omega offers their Smart canopy and carport system. The manufacturers minimum recommended pitch is 5°, to cover adequate drainage , this is a fall of 265mm over 3000mm. This is a minimum , we would recommend a fall of 500mm. Both ends of the polycarbonate sheet should be taped to stop dust and insects entering the flutes. Breather tape should be used at the bottom allowing air as it expands and contracts to exit and enter the flutes. Omegabuild can supply the sheets trimmed and taped. Please visit our website for photographs and sheet comparisons. A roof supporting beam that runs from top to bottom down the slope. Joins two sheets of polycarbonate together. Acts as a rafter as well, needing no additional support. Needs to sit on a timber support. The Snap down bar has an aluminium base which is screwed onto the timber and has a plastic snap on capping Although it is not recommended this bar can be used crossing purlins particularly when replacing corrugated sheet. Please ensure you check the Omegabuild fitting guides for the maximum distances allowed between cross purlins. If in doubt place timber noggins between the cross purlins to create a virtual rafter. The Screw down aluminium bar has a rubber base and can only be used on a complete rafter. The capping is all aluminium with an aluminium screw cover cap and it is screwed into the rafter. This is the stronger and more professional method suitable for all thickness’s of polycarbonate and even single glazed glass. A bar used on the sides to finish off with polycarbonate on one side only. Sometimes an adapted main bar and not always available from every manufacturer. Converts a main snap down bar into an edge bar. Used instead of an edge bar. Useful with its leg that can be used down or up if against a wall. Plastic or aluminium depending on thickness. Put on the bottom of the sheet allowing air in and out of the flutes as it expands and contracts while keeping dust and insects out. Plastic U section with a drip that protects the breather tape and stops water running up the underside of the sheet.